I frequently get questions through Twitter and Facebook about various things. 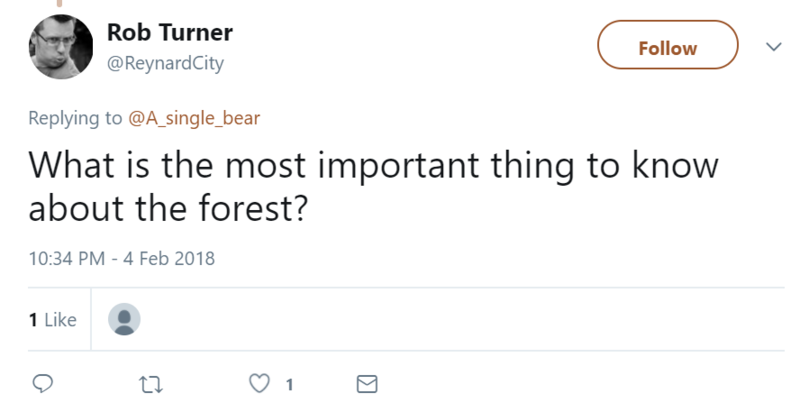 Whether it is life as a bear, things about the forest, bear advice, or personal questions, humans and (possibly) other creatures are always curious about all aspects of bear living. 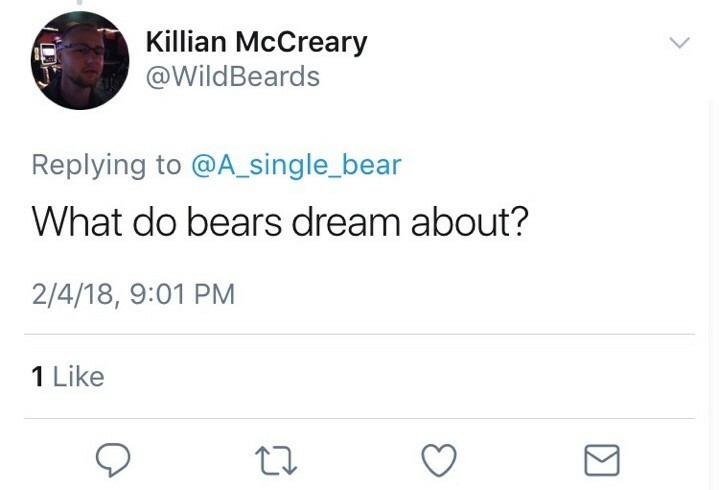 While I am not here to represent all bears, I do like to respond to these questions as best I can by using my personal experiences and viewpoints. I decided it might be nice to answer some more. @A_single_bear What's the neatest looking rock you have ever found? I have seen so many rocks, so it is hard to keep track of every single one of them. 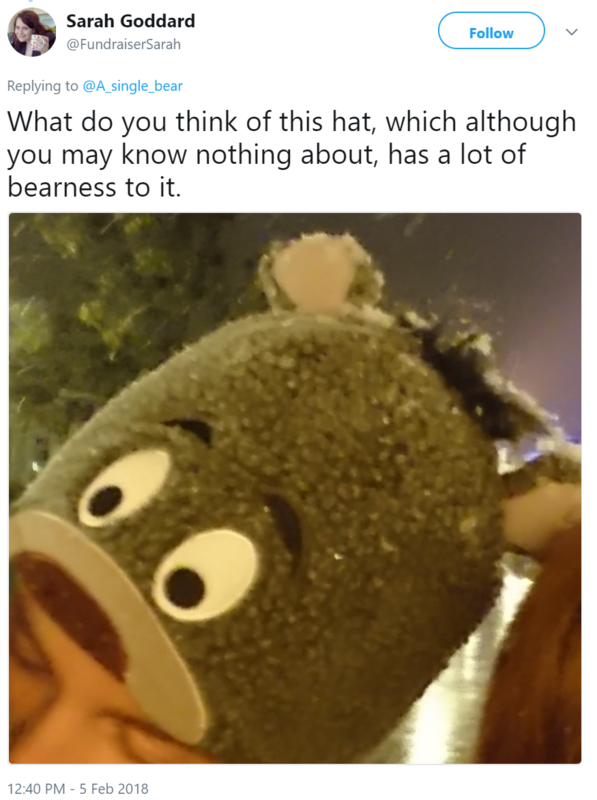 I did see one that I thought was shaped like a bear from afar. When I got closer, it was actually not shaped like a bear. It was also not a rock. It was actually a very angry raccoon holding a rock and hissing at me. And we were in a dumpster together. That was probably the neatest looking rock I have ever seen. Maybe. @A_single_bear Do you have any good porridge recipes? Probably not. One time I put some cans I found into a hole I dug and waited for rain. Does that count?
. @A_single_bear What is the most interesting thing you’ve found in the woods? I once thought I had found an entrance to another dimension or some kind of time-warp, but it was actually an abandoned tent with a mother opossum nursing her children. I only know that because Rob (the squirrel) jumped inside, shouting something about going back in time and saving the prehistoric squirrel. He quickly ran out and reported a very angry opossum and several newborns. I hope that family of opossums is still living there, happy and healthy. Oh, and one time I found an acorn with two mismatched halves for a cap. That was fun, too. @A_single_bear hello bear! been in the woods for a month, only a few days left of vacation. what things should i try to do before leaving? I highly recommend rolling around on the ground for several minutes or until you get too dizzy to keep rolling. If you have done that already (you probably have), you should consider talking to as many trees as you possibly can. Trees have great things to say and are very open to sharing their thoughts and experiences. @A_single_bear Do you like moss? It looks comfortable, but also secretly wet. @A_single_bear hi Bear, long time listener first time caller. What's your favorite moss? Moss is maybe one of the greatest gifts of the forest. It is not secretly wet, it is openly wet (usually), which makes it great for chewing on, resting on, and smelling. It also looks wonderful with its relaxing grey and dark-green colors, making it perfect for constructing a hat or a lovely scarf. Moss is amazing. I highly recommend moss. Any kind of moss. I actually do not know if there are different types of moss, but if there are, you should try them all. I have never met any mountain goats, but I am sure you can trust them. And even if they wrong you (and you know there’ll always be a few things, maybe several things, that you’re going to find difficult to forgive), there’s going to be a day you feel better. @A_single_bear how do you handle your commute in the snow? @A_single_bear Do I need a five-year-plan? 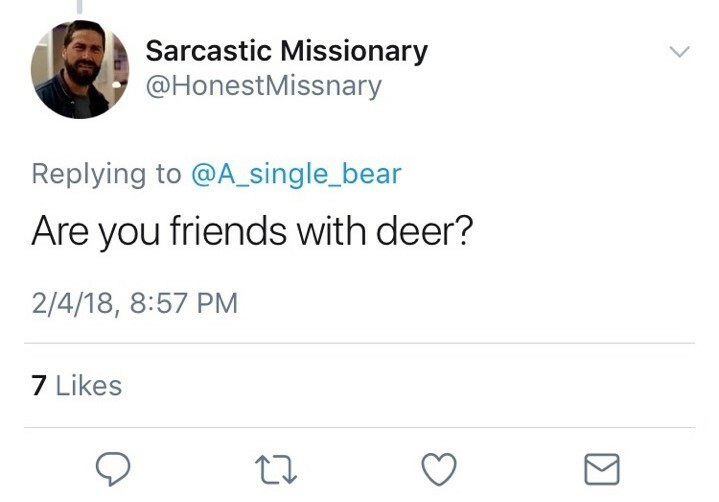 Do bears have them? I do not have a five-year-plan. I understand it is good to plan and to have goals, but I usually try to enjoy whatever event or thing currently occupies my time. This is not always easy either, however. It is very easy to get distracted by what you do not know or want to know or know too well. I still try, despite often failing, to enjoy the taste of the tree I am licking or the fact that I am not being mocked by deer or the faint glow the moon has when it shines through a lightly cloudy night. Your five-year-plan should probably be to just do your best. 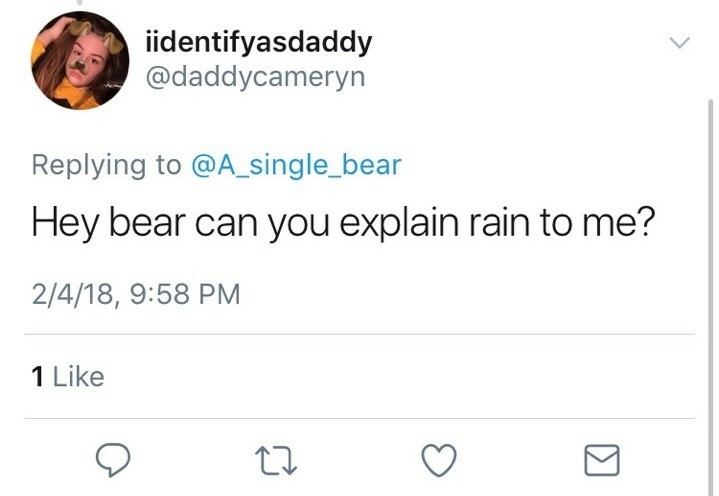 Not much more can be asked of bears, or even human I would guess. The wind is very loud and very pleasant and makes your fur stand up and smells neat. I like the wind. 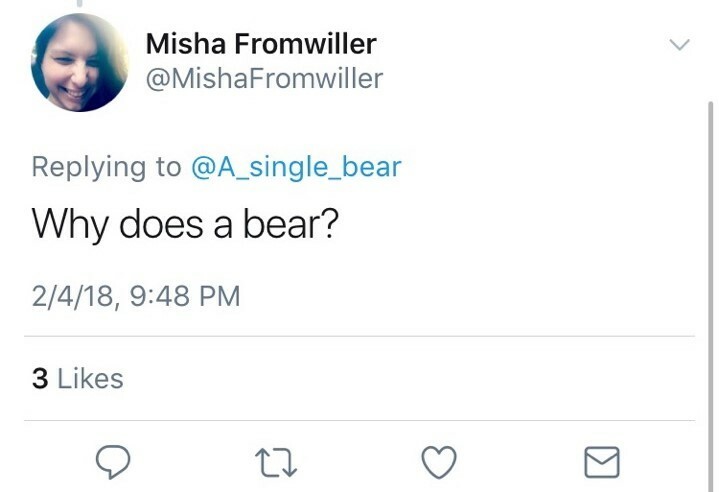 @A_single_bear What is your favorite bear activity? Smelling things. Licking new things. Finding new smells. Finding new tastes. Looking at things. Digging holes. @A_single_bear Bear, what do you do when there are not enough things to eat? It is important to look for things to eat everywhere you go. Always keep your nose up and sniffing. If you are still truly unable to find anything to eat, you might need to ask for help. If you are kind enough and lucky enough, you might be able to find a friendly squirrel or raccoon who will not attack you and instead share their own findings. It is always better to ask for help than to go hungry. Being hungry is not fun. @A_single_bear How do you cope with not being able to help every single baby bird in the forest, no matter how much you try? I try not to think about it too much, but it is a realization I have had. It is not an easy thing to have in your brain as you try to traverse the forest in a peaceful manner. It is completely out of my control, however. If there were more I could do in a meaningful way, I would. I just try to occupy my brain with other thoughts. @A_single_bear Are the bees your friends, or not? Bees and I do not usually get along very well. @A_single_bear #BearAdvice sometimes I have panic attacks, how should I handle these? If you are being attacked by panic, the best thing to do is to remember that whatever is causing your panic to attack you is probably not always going to be making your panic attack you. Whatever it is, it will probably one day not be around, making your panic do awful things like attack you. You are not stuck. Also, try to think about trees or finding food in a trash can or moss or other lovely things that calm you down in moments of intense stress. @A_single_bear A squirrel told another bear that a berry patch in my territory was hers. 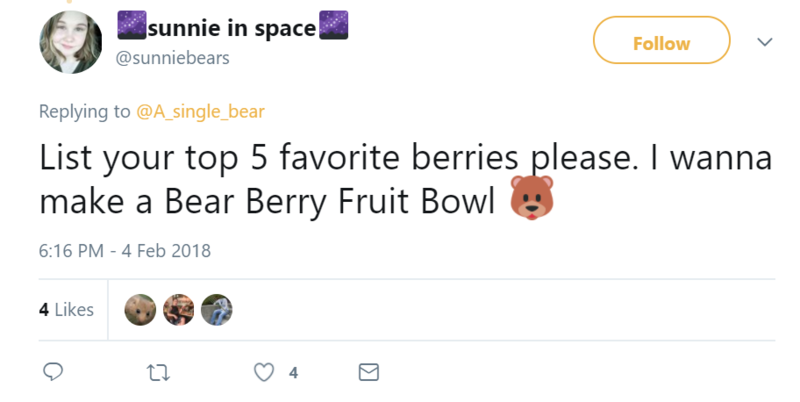 How do I correct this w/ the squirrel & other bear? I think you should be more open to sharing the berries. Always share your berries. @A_single_bear D you stuff people into animatronic suits? Regardless of gender, please do not urinate on or near bears. I would also suggest utilizing your mouth in order to make human speech patterns. I believe that is how most humans do it. @A_single_bear can you add pine cones to forest stew? Are you sure that was a rock? Rocks do not usually pinch unless they are under a lot of pressure. Rob (the squirrel) is the only squirrel who talks to me. I see other squirrels all the time, but they seem too vested in whatever acorn related businesses they are working on to spare any time for me. 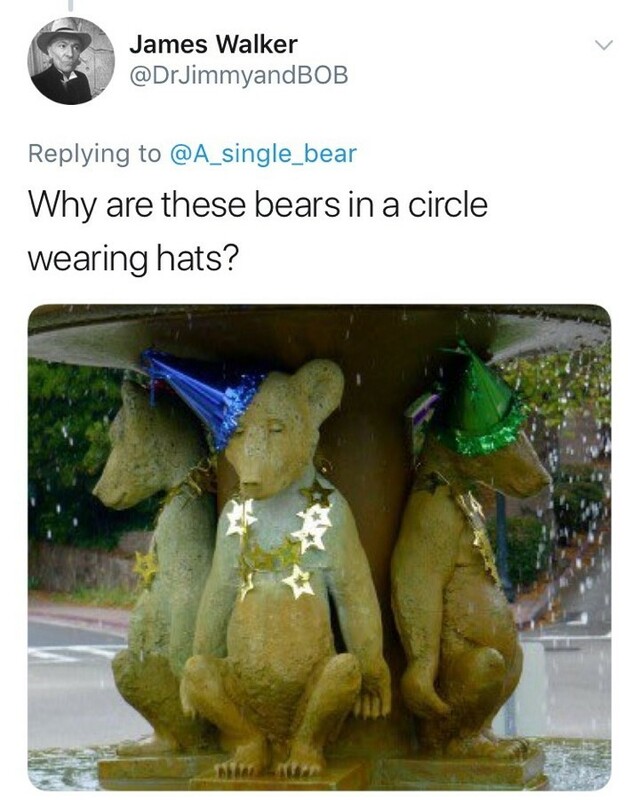 Perhaps they have other bears to talk to. 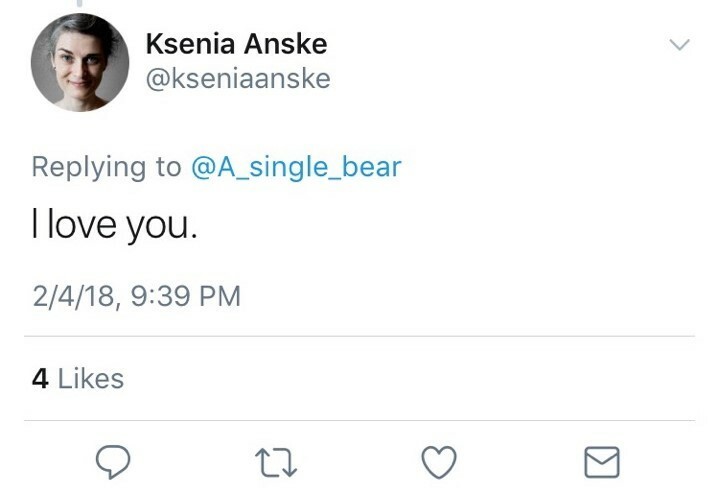 @A_single_bear do you ever quietly watch humans and think "I want to be a human?" 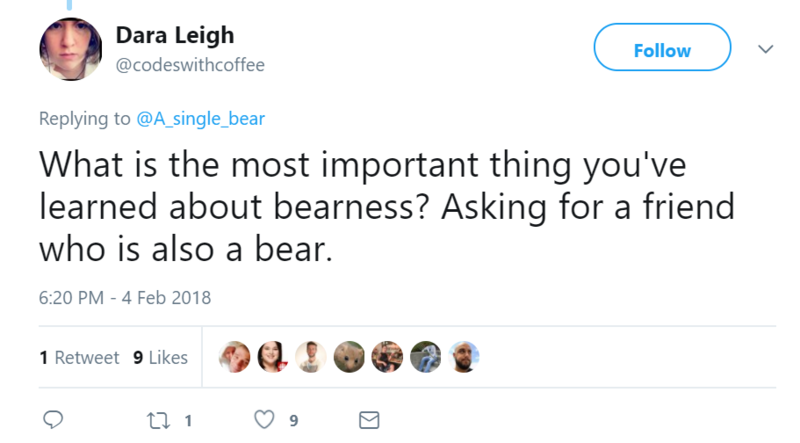 Or are you content with your life as a bear? I am absolutely content with being a bear. However, I sometimes wish I had thumbs. Thumbs would be nice. I have endured many struggles as a bear. But I would say the toughest has been trying to get all the peanut butter out of a discarded jar. My tongue only goes but so far. Parting with the unattainable remnants at the bottom of a jar is the hardest thing I have experienced. That and coping with the deaths of fellow woodland creatures. That is hard, too. Being a bear… And fur. Lots of fur. 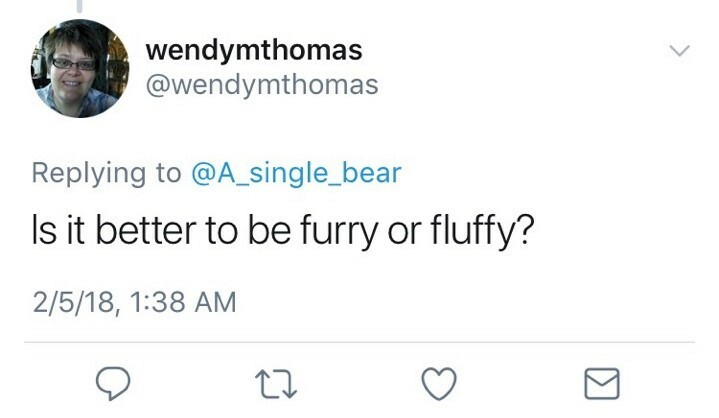 @A_single_bear what animal are you most jealous of and why? Birds. I am certain birds carry on conversations with the moon as they sing and whistle throughout the night and day. Who else would the moon talk to? Not me, apparently. I would like to talk to the moon. Thank you, again, for asking me questions. I am always so taken aback by how interested many of you seem to be in my life as a bear. I apologize if I did not get to your question. There were so many to choose from. I hope you enjoyed my responses. If you need more bear things in your life, you can read my bear thoughts on Twitter or try being a bear with my choose-your-own-bear-adventure story. I look forward to answering more of your questions sometime in the future. 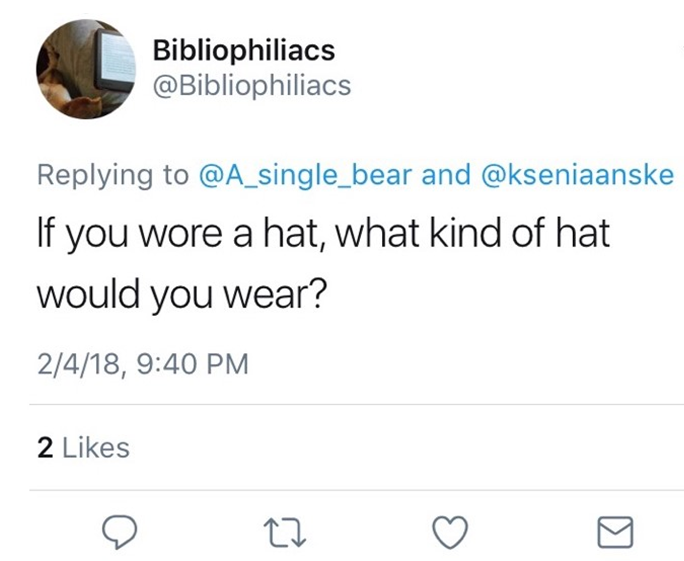 This entry was posted in Questions and answers and tagged @a_single_bear, answers, bears, Facebook, Human Question, I am a bear, mountain goats, Q&A, questions, twitter on January 28, 2015 by A bear.